First. Blog. Post. Ever. I’ve finally crawled into the 21st century and decided to blog. Lord help everyone that reads this. A good friend of mine and I always joke around about starting a blog and then having it magically turn into a movie and/or book deal you, you know, Julie & Julia style. And, the first step in that direction would be to find something that makes me noteworthy and actually start a blog. So, here goes nothing. OK, maybe not forever, just changed it for right now. We’ll see how long it lasts. Anyway, at the doctor’s appointment, I realized that what I gained through my college experience, along with a degree and life lessons, was weight. Lots and lots of weight. And, not only was it affecting the number of pounds on my body, but also my blood pressure and cholesterol. Holy wake-up call! I’m 23! Am I really going to put myself on the ultimate path to diabetes and heart disease already? And, that’s when I decided, absolutely not!!!! Something was going to change and it was going to change now. But seriously, I never considered myself fat. I was happy with my body and my appearance. However, something I was not happy with was heart disease and diabetes, so something had to change. My doctor suggested a certain program, a very popular one which I’m sure you’ve heard of, in which you attend meetings and keep track of your food by tallying it. I was pretty unsure about it. OK, maybe just too prideful, to attend the meetings. Weight loss was a much more private thing to me and I wasn’t ready to share that experience with everyone. But, now, here I am, blogging about it. The irony. Anyway, I decided to enroll in the program online. And, so I did. I did not have, and still don’t have, an ultimate goal in mind, such as running a marathon or fitting into a size 2. I just wanted to be healthy. I would like to stress that. I felt that I was already beautiful, as I think everyone should. Weight is nothing but a number and no one should ever consider themselves unattractive because of their weight. I was concerned with being healthy. You know, living a long, fulfilling life and enjoying every minute of it. So, I think that, if you decide to lose weight, it should never be because you want to look like a swimsuit model. It should be because you want to be healthy and feel good about yourself. The prettiest women stand tall, with their heads held high and a smile on their face. And, three months later, I am happy to say, that I have lost 29.5 pounds. The program worked amazing for me and I would recommend it to anyone, whether you want to lose 5 pounds or 500. I have about 10-15 more I would like to lose. …This is where the blog comes in. Everyone says those final ten pounds are the hardest to lose. I need to stay motivated and inspired. And this is how I’m going to do those, by having millions, yes millions, of people read my blog and see the movie that this blog will eventually become. I want to tell you about my daily struggles. What works for me and what doesn’t. I also want you to chastise me when I decide to eat a hundred cookies and a tub of ice cream, after polishing off a pizza with a pitcher of the darkest beer the Germans have to offer. Also, I feel like there’s something I have to divulge in order to be completely honest with everyone. That is my weight. Here are a few before and, not really after cause I’m not done yet, we’ll call them middle pictures. This is a particularly rough picture. It was warm, I was sweaty. It's just all bad. This was taken last summer at a good friend's wedding. (I'm on the short one on the far right.) 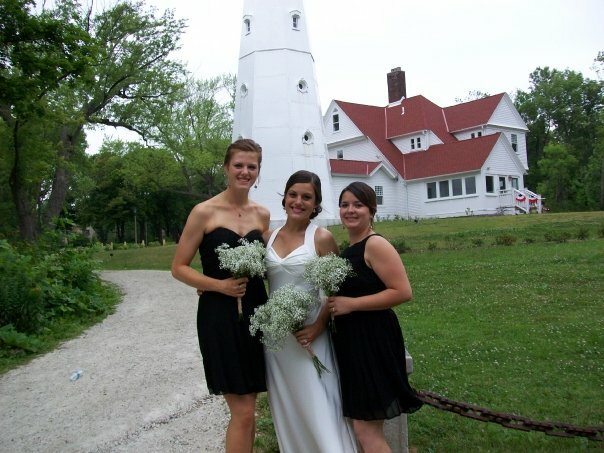 We all looked beautiful. It was a wonderful day full of wine and dancing. Doesn't get much better than that. I like this before picture because I remember how much I loved my look from that day, and I still do. I loved my dress, my hair, and my makeup. And, here's an excellent middle snapshot. 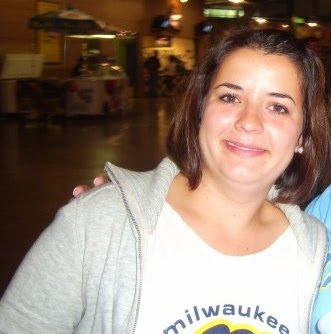 It was taken at the Milwaukee Brewers' opening day game. (I love the Brewers and baseball. It's my favorite sign of summer. I'll write more on it later.) Note the much smaller cheeks. I'll get more middle shots up soon! I also am on the certain program where you go to meetings and track :-) It has worked out great for me as well. I just started a blog today, similar to yours. I wish you continuous luck on your weight loss journey!